Pumpkins and Spiders and Gourds, Oh My! This weekend is the big Harvest Festival at the Del Mar Fairgrounds (visit www.HarvestFestival.com for more info). If you like to decorate your home for autumn and winter holidays, this is a great place to go for original arts and crafts. Why do I bring this up? Well, I’m known at Style on a Shoestring for holiday decorating. I started it when my kids were small and even through they’re all older now I still enjoy adding holiday flair to my home throughout the year. It’s cozy and friendly — and I notice it brings a smile to people’s faces when they see my little pillow with “Boo” on it or my colorful door wreath. And the thing about holiday decorating is it really functions best as a “less is more” strategy. 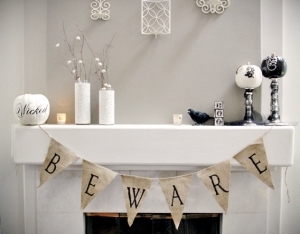 That also takes the pressure off if you don’t have the time or budget to completely deck out your house. 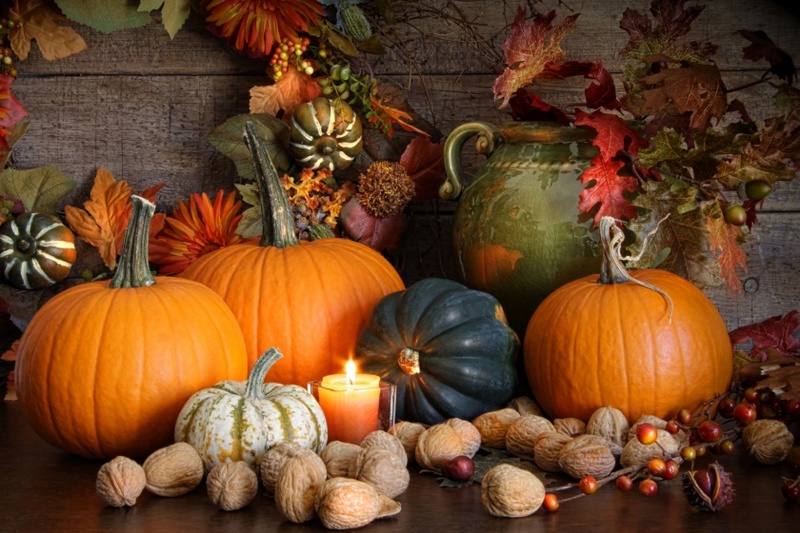 In fact, you can decorate for Halloween and Thanksgiving at the same time — just remove the spooky stuff after Halloween and leave the pumpkins, burlap and sunflowers. Here are some visual tips for this fall’s decorating season. No time to carve a pumpkin? Buy a ceramic version and add a candle. Plus you’ll have it for every Halloween — no more goopy pumpkins! Here’s an over-the-top fireplace mantel! But what I like about this is once this decorator removes all of the Halloween items, her gourds and fall flowers will remain through the Thanksgiving holiday. This is a great example of two-for-one decorating. 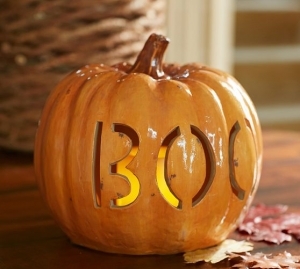 Fall decorating doesn’t have to be complicated. How easy was it for this person to toss a few pumpkins and gourds into her cart at the grocery store and then add a few fall-colored accessories she probably had already? 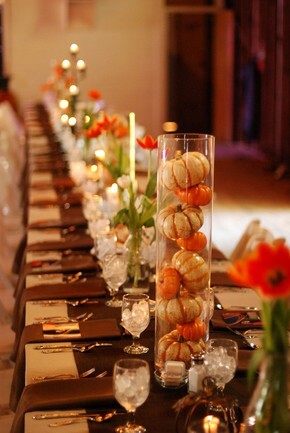 Keeping our eye on easy, look at this clever way to use vases for instant fall color. 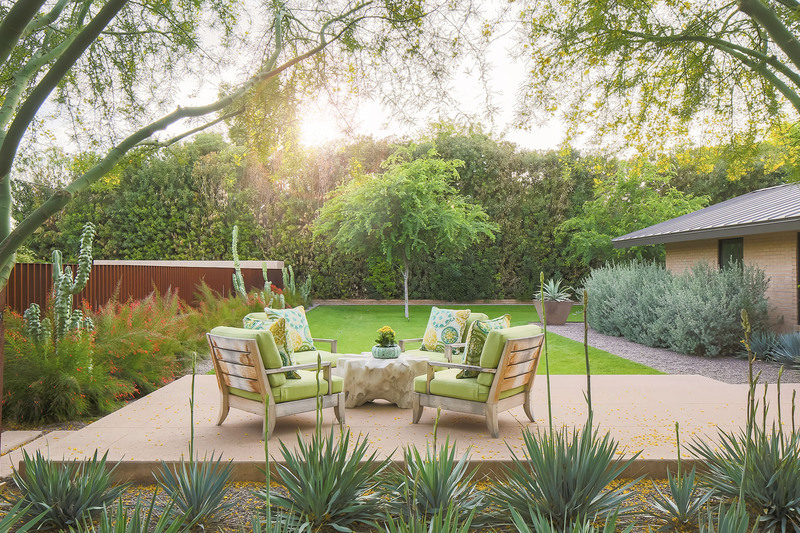 Maybe your house’s color scheme doesn’t lend itself to fall’s oranges, reds and golds. 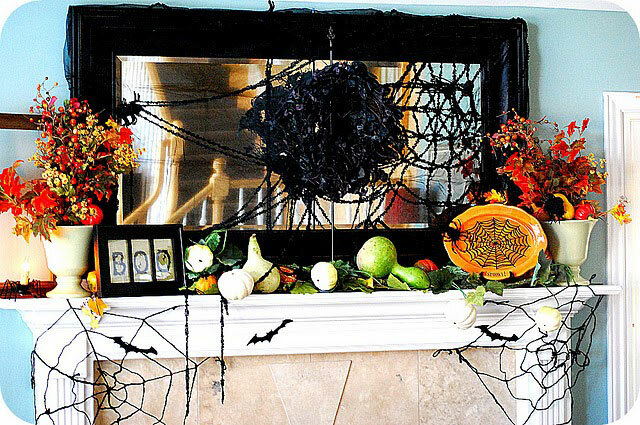 Here is a beautiful example of how you can still decorate for Halloween while maintaining your home’s decor. Did you know we offer holiday decorating services? We can use your existing items and/or add new decorations to your home. To find out more or to talk with us about any of your home remodeling or design needs, please contact us for a complimentary consultation.